My exhibition Stories We Tell Ourselves is in the middle of its run at 541 Art Space (Level 1, 541 Kent Street, Sydney, www.541artspace.com.au). If you haven’t yet seen it, you’ll need to get a move on. It closes on Saturday September 22. I’m running one more textile workshop on the final day. If you’re interested in coming along please contact the gallery: 541artspace_program@nanhaimedia.com (closing drinks are included!). 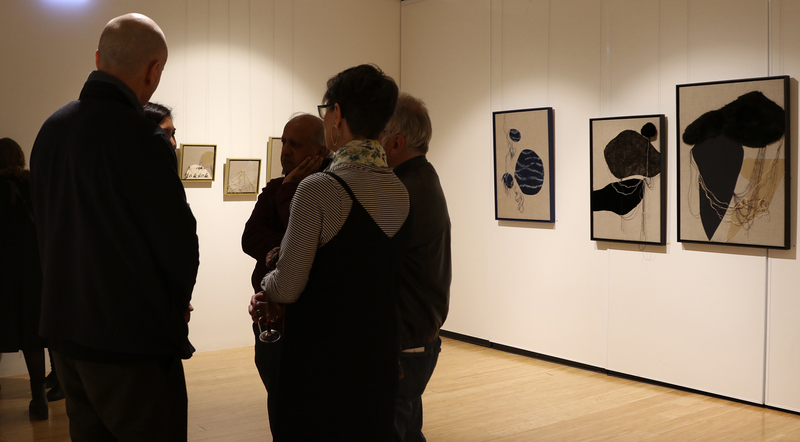 In the meantime here are some images from the opening night. Much gratitude goes to Alison Clark, Team Leader Arts and Culture North Sydney Council, for her thoughtful and eloquent opening speech. Below are a couple of images from the first workshop. Mounds of linen, textile scraps and yarn – a lovely way to spend a spring afternoon! I hope you get to see the exhibition. I’d love to know what you think. Advance exhibition notice. Save the date! I want to tell you about my upcoming solo exhibition Stories we tell ourselves. With the crazy-busy lives we all lead these days I thought I’d give you time to schedule it into your diaries if you can. This body of work examines the relationship between worn and discarded cloth, their poignant associations with memory, and the narratives they generate. 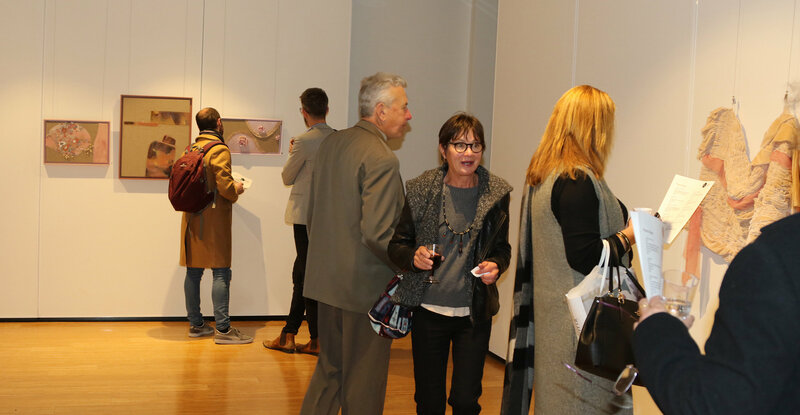 Each piece represents a unique story, imperfectly remembered, translated into ‘pictures’ of moments in time, and readings of relationships. And here are a few images of work in progress. I hope they pique your curiosity! I’ll be running a couple of textile art making workshops during the exhibition too. I’ll post more details closer to the opening (August 31). I’m delighted to re-exhibit my 2013 work Reminders in the Inside Outside Sculpture Plinth in North Sydney’s Civic Park. The work is now configured differently inside its new glass display case: less that half its original size and without the rusty wire roses. This piece, originally made as a site specific installation for the Hidden exhibition at Rookwood Cemetery, employs the concept of the veil, alluding to the crossing from life to the state of death. The film of sheer organza is embroidered with handwritten words and phrases, obtained from the personal correspondence of various members of my family, that relate to the loss of loved ones. Here are some day and night photographs in its new display location. The original work wrapped around a tree and was staked to the ground with rusty wire twisted into the shape of roses. The newly configured work will be on display in Civic Park for the next few weeks. On another note: the Public Programs for my residency at the Coal Loader Centre for Sustainability have been finalised. You can click on this link to see when Open Studio days are scheduled, and check out the free workshops I’m offering for adults and children. For a more comprehensive update on planned classes and workshops at various locations please check out this link to the News section of my website. I’m now offering an adults’ term class in creative processes at Ku-Ring-Gai Art Centre, as well as an assortment of stand alone workshops. I hope you get to see Reminders while it’s on show in North Sydney. I’d love you to get in touch and let me know what you think! I just wanted to let you all know about my upcoming kids’ school holiday workshops. Book your crafty, stitch-crazy kids in for some imaginative and skill-building creative time! Share in an imaginative day of stitch drawing: making marks and drawing on cloth. We’ll use some basic hand stitches with different thread to create texture, line and pattern. Use your wild imagination to make an experimental abstract or figurative picture. Take home your own original cloth drawing. This is a really fun workshop. Like collage with stitching. And the kids will get lots of recycling ideas! Ideal for ages 8+ years. Spend a day making hand sewn Japanese boro style cushions! We’ll use reclaimed Japanese fabrics, denim and reused cloth to stitch our creations. Cost includes all materials. I’m always developing workshop ideas, so if you’re interested in other workshops or have ideas of what you’d like to learn, please get in touch. I gave a one-day Japanese Boro Bag Workshop to some really delightful and enthusiastic kids this week at Ku-ring-gai Art Centre. I was amazed at how quickly some of the kids grasped the concept as well as handling needle and thread. One little grade three girl did the neatest backstitch for the seams (have a look below)! We used denim from old jeans, calico, old Japanese indigo-dyed cotton, an old indigo-stencilled yukata and a few other bits and pieces, and stitched with linen thread, sashiko thread and fine string. 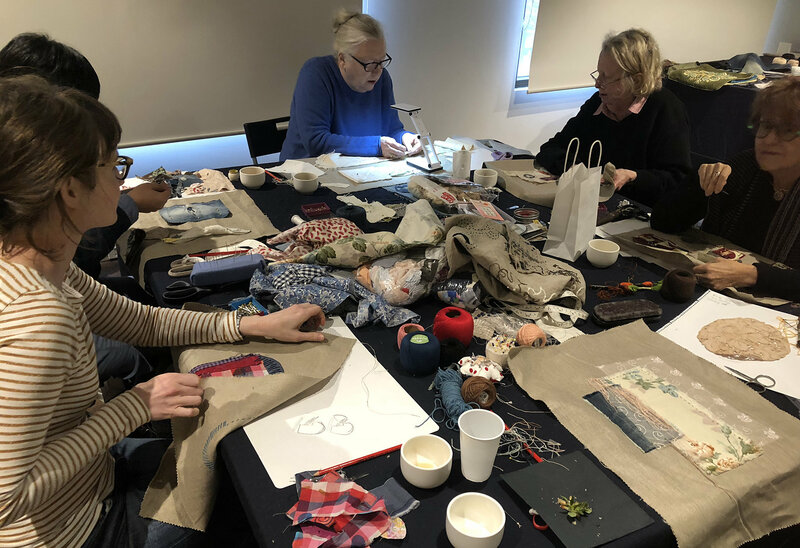 They were very receptive to the idea of using old clothes in this way, and we talked about the aesthetic appeal of combining these fabrics with a limited palette and varying patterns and textures. I pre-sewed the bag linings to save time, and sensibly, brought the sewing machine so I could hurry things up towards the end of the day, but the kids were keen to hand sew the side seams. I’ll think I’ll need to make the workshop a two-day one next time. The results were just beautiful! And the kids learned so much too. Two full classes and a hugely enthusiastic tribe. What more can you ask for? Running the Stitching Memories workshops at Lane Cove Library was delightful. Its always an amazing thing to see what people do with their work: all have different approaches based on a photograph of their own selection from the Library’s historical image collection. I showed how to transfer a design (or text) onto a photograph, and various ways to stitch, showing my own examples and those of other artists, always encouraging participants to be free, non-judgmental and experimental. Some people chose images reminding them of their families or homes, others chose randomly, while others decided on imagery completely unfamiliar to them. All the examples here are works-in-progress. A two and a half hour session really just provides an introduction to the possibilities. Sometimes just a touch of stitching here and there is enough to make a quirky statement. The addition of text can change the entire reading of an image, and over-the-top stitchery is certainly not out of place in this workshop! And did I mention the camaraderie involved in these sessions? 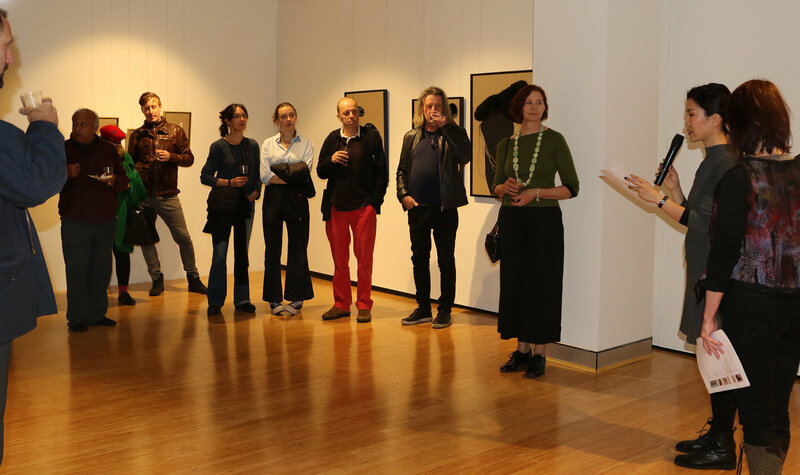 I have one more session in this series coming up at Gallery Lane Cove on Saturday March 11, with a slightly different focus. 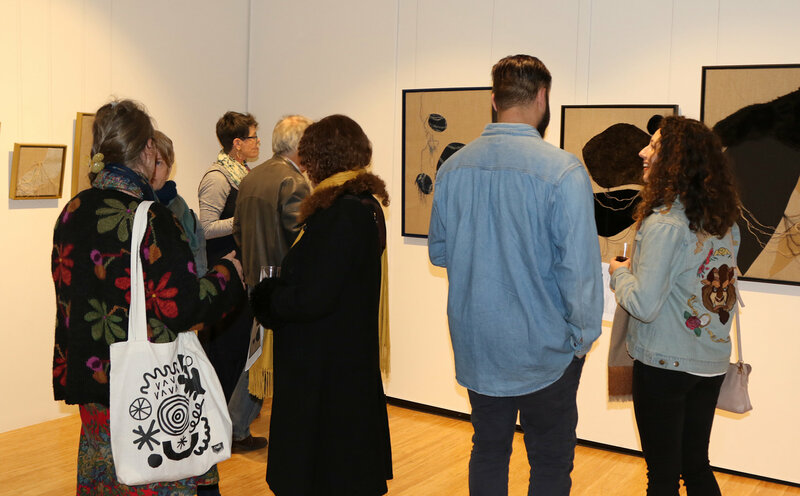 The Stitching Your Memories workshop is free, and will be running in conjunction with the exhibition Translating Displacement, which shares stories of former refugees, asylum seekers, citizens and non-citizens whose families fled war and violence to settle in Australia. 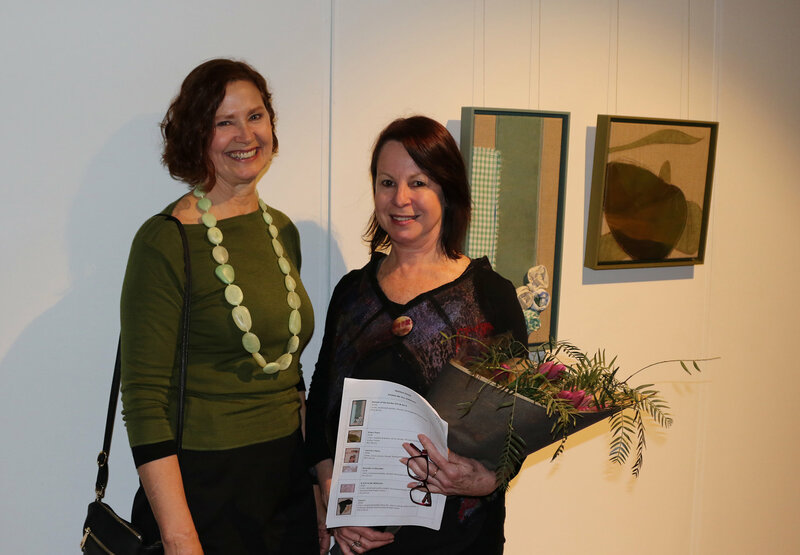 If you’d like to book please phone 61 2 9428 4898 or email info@gallerylanecove.com.au. Please join me for one of the free Stitching Memories workshops being offered by Lane Cove Library in February. 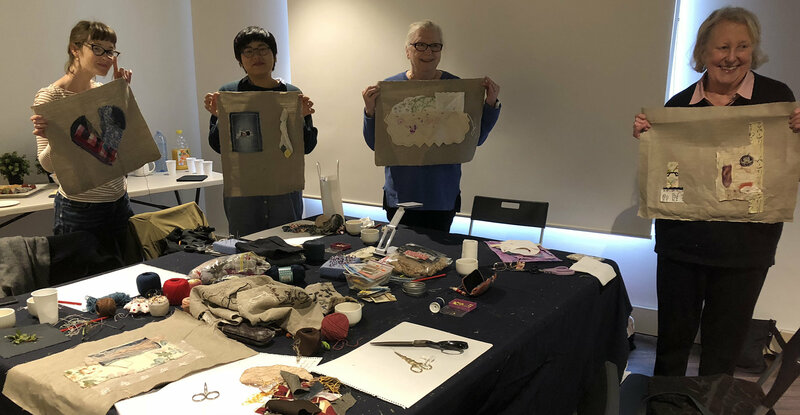 Develop new art making skills while we explore memory and image making using a selection of historical photographs from the Library’s collection. Using text, hand stitching and cloth we’ll create new images from old, superimposing our contemporary lives onto photographic images of place and time from another era. Library Walk, Longueville Rd, Lane Cove, Sydney. I hope you can come and enjoy a fun afternoon with us while sharing your own ideas and skills. You’ll be in good company!